If you are familiar with hunting canines, then you know that they are very energetic animals. They come in all sizes and shapes, but they all have one thing in common – an active lifestyle. And because of this energy expenditure and extra activity, these dogs need different nutrition than some traditional pooch would require. With that in mind, we have made a guide of what you should be feeding your furry friend compared to a standard pup of the same breed. We will tell you everything you need to know about meal schedules, quantities, and nutrients that are ideal for him. If you want to awake the greatness within your dog, then you should consider purchasing the Purina Pro Plan pet food. This recipe is designed to promote endurance and strength with 20 percent fat for energy and 30 percent protein to build muscles. It is enhanced with antioxidants, minerals, vitamins, amino acids, and glucosamine for mobility and healthy joints. The great thing about this formula is that it provides a balanced and complete diet for canines of all activity levels and ages, including dog athletes and working pooches. It doesn’t include artificial preservatives, flavors, or colors, no wheat or soy. If you want the best performance dog food for your furry friend, you should provide him with this product. He will also love the taste of these kibbles. If you are looking for the quality food that is excellent for your hunting dog, then look no further. This formula contains high levels of energy and protein with only 30 percent carbohydrates. Your dog will undoubtedly love the flavor, as it includes fish and poultry. The recipe is designed with minerals, vitamins and other advanced ingredients that are combined to support a healthy and strong immune system and digestive system of your furry friend. It features Omega-3 and omega-6 fatty acids, and Vitamin E to promote healthy and shiny coat and skin. We need to mention that this meal doesn’t contain gluten, soy, wheat, corn and it is also GMO-free. So, we think that you cannot go wrong with this great product, as it contains everything your active canine needs. Eukanuba’s philosophy of nutrition is that the canines need to be fed as carnivores. This great recipe will help nurture the best qualities in your furry friend. It is made with the highest level of fat and protein to promote sustained energy and lean muscle for better performance. The formula will provide your working or sporting pet with hundred percent balanced and complete diet without using any fillers. What we want to mention is the 3D DentaDefense System, which will decrease tartar build up in only a month. The calcium that is contained in the formula will promote strong bones. This excellent product is perfect for hunting and field trails when your dog needs that extra energy. If you are looking for the foo that is best for cognitive function, then you should provide your puppy with this fantastic product. This dog food is designed for performance puppies and canines, and it is also excellent for best small hunting dogs. The formula is made with hormone-free chicken, brown rice, fish and antibiotic. It also includes Omega-3 fatty acids that will support healthy skin and coat. L-Carnitine’s that is featured in the recipe will support healthy cognitive function and help maintain lean muscle mass. DHA that is also included will support healthy cognitive function and brain development. If you want to provide the best food for good hunting dogs, then you should buy this great product. It uses Proteinated Minerals which strengthens the immune system and increase their utilization. This recipe for your hunting canine is ideal for improving and supporting mobility. Black Gold Explorer formula is balanced with all the essential nutrients that your active dog needs to lead an adventurous lifestyle. It features chondroitin and glucosamine for added mobility and healthy joints. The formula is made with Omega-3 and Omega-6 fatty acids for EPA and DHA. The great thing about this product is that it contains oatmeal and probiotics for sensitive stomachs. The formula doesn’t contain artificial preservatives, flavors or colors, and no by-products. It is made with a high level of protein to increase the level of energy for endurance and stamina. There are hundreds of breeds that you could consider hunting canines, but there are some of them that will cross your mind whenever you think of them. In general, the most common hunting pooches are either considered gun dogs or scent hounds. Scent hounds make a lot of noise while running after their pray and follow its trails with their noses. On the other hand, gun dogs are used to hunt birds. They flush the prey out for the hunter after they have located it. The ones that are considered as best hunting pups are also very popular for their friendly personality. A lot of people own these hunting pups, but they don’t use them for sports. The larger hunting dogs could have issues with hip dysplasia. This medical condition is mostly inherited, but obesity and injury are the things that can worsen this problem. If you are considering breeding them, you should have your pup x-rayed and rated by Pen-Hip or Orthopedic Foundation for Animals. Arthritis can be developed when the thigh bone’s ball doesn’t fit well into the pelvis’ socket. One more reason why your dog might get this medical condition is obesity, especially if your dog is older and doesn’t exercise regularly. That is why it is essential to keep your pooch slim and active. If he has this disease finds some soft surface for exercises. Always ask your vet what can you do to make your pet feeling more comfortable. Bloat is another health problem that usually affects narrow-chested, deep canines such as Weimaraners, German Shorthaired Pointers, Irish Setters and others. The stomach can be filled with gas or air, which will make your dog feel uncomfortable. It can be a life-threatening condition as it can twist the stomach and cut off the blood supply. In these situations, you need to react immediately and take your furry friend to the vet so he can get the medical attention he needs. Bruises, lacerations, cuts are just a few surface tissue injuries your canine could experience. Most of them will be in the footpad area. It is essential to always check for these kinds of injuries after each hunt. And don’t forget to bring first aid kit so you can help your pup before you take him to the vet. All these injuries will take some time to go through predictable healing stages. Depending on the tick species they can be hard to notice at first, especially if your furry friend’s coat is thick. They can infect your pooch with different diseases such as Canine Ehrlichiosis, Rocky Mountain spotted fever and Lyme disease. Make sure to check your dog once you have finished hunting. Signs of infection can appear after a month. If you notice some strange behavior, joint pain, lameness or lethargy you should call the vet. Overworking your pup can cause mobility issues and discomfort. As he ages, the chances for these medical problems are increasing, so what you need to know is his limitations. He might not be able to hunt if it is too cold or too hot outside as it can worsen the joint stiffness. If you notice some mobility problems, you should take your pet to the vet. Most experts recommend feeding hunting pooches diet that has about 20 percent fat and 30 percent protein during hunting season. You should begin with this diet when you and your canine start training. It is recommended to feed him two meals per day, but some experts also suggest to give your dog meal only once a day. That is why it is best to talk with your vet and find out everything you need to know about the proper diet and nutritional requirements of your pooch. But, you must be wondering what to do when the hunting season is over. You will need to reduce the calories intake if you want to feed your dog still a performance diet. He will not get a lot of workouts, and he will probably gain weight if you don’t be careful with this meal plan. 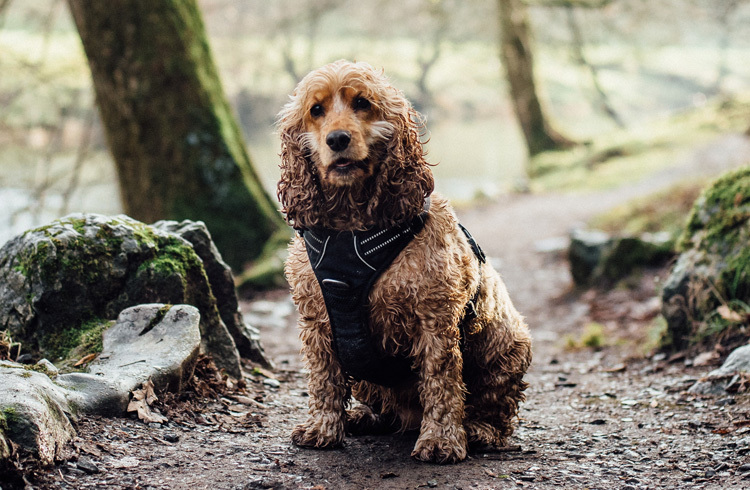 As we have already mentioned in this article, hunting dogs are very active pets which means they require more calories than some traditional canines of the same breed. It is important to remember that they will need more calories in their diet, as it will provide them with the ideal energy level and support their immune system. Your dog needs to be and feel full for longer periods and the best way to get that effect is to provide him with enough level of protein. Feeding a hunter pup is a very responsible task and might be even harder than feeding some regular dog. The protein is essential for your dog, especially when he exercises a lot. It provides him with much-needed energy. It also enhances the flavor of the meal which can be very important for those picky eaters. The high-quality dog food should have at least 30 percent protein if your pooch is very active. Fat is the best source for endurance in hunting pups. Feeding your dog a high-quality diet that has at least 20 percent of fat, will help him perform stronger. And when your dog is very active, he will need his strength and energy. You may think that this sounds strange, but remember that dogs digest fat and carbohydrates different than a man. Fiber is one of the essential nutrients that is listed on every dog food’s bag. Its type will determine the role he plays in the digestive system. It comes primarily from the cell walls of grains and plants featured in the meals. By adding the fiber to your pet’s meal plan can improved different medical issues. Vitamins and minerals are essential for your dog. Providing him with the best nutrients will strengthen his immune system, strong bones, joints, and muscle. Potato and corn give him the carbohydrates energy along with the fiber and minerals. Read the instructions carefully on the dog food bags and see what minerals and vitamins some particular meals has to offer. We have already mentioned that carbohydrates are good for your dog’s diet and that there is nothing wrong with adding complex carb in his meal plan. But, bear in mind that when you are buying the proper dog food for your furry friend, get the one that features sweet potato or brown rice as a source of carbohydrates. The National Research Council of the National Academies has some recommended for hunting dogs when it comes to calorie requirements. Your pooch will require around 1030 calories per day if he is doing light work and weighs 30lbs. If he does exercise, he can have about 1311 calories per day. And if he is performing heavy duty tasks, he requires between 1873 and 3747 calories per day! What you should remember when you are purchasing dog food for your hunting dog, is to measure his activity level. It is not the same if your pooch performs heavy-duty tasks or doing some light exercises. Depending on his activity level you should be able to provide him with the best quality dog food. That way he will get all that energy he needs while in hunting. Your canine requires 7.5 percent more calories, each time temperature drops for 10 degrees. You should pay attention to the weather, especially if you live in an area with a lot of variation in the temperature. 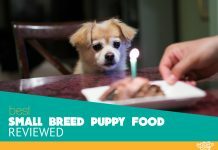 You don’t want to overfeed or underfeed your pup after he had some very active day. We have already mentioned that some experts said that it would be best to feed your dog two meal per day. But on the other hand, there are also some other experts that said it would be better to feed the meal per day. You should know that it is not the end of the world if you decide to provide your dog with some high-quality kibbles if he is very active. But, bear in mind that you should always include some other factors in your final decision. What is the best brand for hunting dogs with allergies? The best brand for hunting canines with allergies would be the Purina Pro Plan. This recipe includes high levels of energy and protein with only 30 % carbs. And the best part is that it doesn’t contain any artificial preservatives, flavors, or colors, any soy, wheat or corn. The protein gets from the fish and poultry, which also enhance the taste of these kibbles. Is dry food recommended than wet food for hunting canines? In many ways, canned pet meal can be better than kibbles. This is because they usually feature more protein from meat than dry food. Also, they don’t contain too many carbs, which is also excellent for hunting pups. Another great thing about canned food is that they are air-packed and doesn’t contain synthetic preservatives. Is grain free puppy food safe for hunting breeds? Yes, the grain free puppy food is safe for hunting breeds. You must be wondering why. Well, let us explain. The grain free dog food avoids filling out the weight with grains and cereal your pooch will find very hard to digest. Wheat, corn, and cereals features complex carbs your puppy will struggle to digest. We hope that our hunters special dog food reviews have helped you to discover and learn what your pup requires. The Purina Pro Plan is the high-quality food that is recommended by many veterinarians and experts as it is made to promote your canine’s strength and endurance. Our team carefully chooses all these dog foods after many hours of research. Any of these products will be more than capable of providing your pup with the nutrition and energy they need to promote an active and happy life. He will be alert all day long, focused, energetic with any of these kibbles in his stomach.